Playing isn’t just for kids. All work and no play is a very bad idea, because the importance of play can’t be overstated. Playful activities for adults—like sports and physical games—help support mental and physical health. Most people grew up playing, having fun, being active. But work, stress, and “adulting”—paying bills, taking care of situations, and making important, responsible decisions—gets in the way. Many adults who grew up playing sports trade in their cleats and jerseys when they settle into a 9 to 5 job. A Harvard study found a steep drop-off in continued athletic involvement at age 26 among those who played sports in their youth. Lack of time, interest, and good health are often cited as reasons grown-ups tend to leave the fun to their kids. But researchers say that adults who play sports not only benefit physically from the exercise, but see mental, social, and work improvements, too. If your current workout routine involves staring at a TV while using the elliptical, or running the same streets through your neighborhood, mixing up your workout by playing a new sport can help you find renewed interest in your fitness routine. Practices and games are usually scheduled in advance, so you can more easily cement it into your calendar. Playing team sports has another important element of a successful fitness routine: built-in accountability. People are counting on you to show up to play your position, and might have to forfeit time, money, and the game if they don’t have enough people there to play. Of course, playing sports isn’t for everyone, even if you played in your younger days. Always check with your doctor before taking up any new fitness routine, especially if you have prior injuries, asthma, or other medical conditions. Plus, you’re assuming a small risk of getting injured while playing. But if you’re given a clean bill of health, joining a sports team or signing up for tennis lessons could be a great way to boost your well-being. Cardiorespiratory health. Studies show that physical activity benefits your heart, lungs, and blood vessels. About 40 percent of coronary-related deaths can be traced back to inactivity. So, getting moving can significantly impact your cardiovascular health. Bones and muscles. An active lifestyle maintains muscle strength, balance, stamina, and bone density. All are important factors as you age. Since most sports are weight-bearing activities—basically anything that has you up and moving on your feet—they help new bone tissue form. Keeping yourself moving is even more important for those that are at risk for bone loss. People who exercise report having an easier time falling asleep, and then sleeping more deeply throughout the night. The only caveat for this is physical activity too close to bedtime. That gets some folks too energized to sleep. If you prefer to work out late in the day, be sure you give yourself enough time to come down from the “runner’s high” before hitting the sack. Sure, exercise does your body good. But did you know that play is also good for you? That’s right: Your brain needs play. Play is a human need as basic as sleep. When you’re deprived of play, your mind and body feel it in the form of crankiness, down moods, or just feeling stuck in a rut. You need a break during waking hours from thinking and worrying. Play of all kinds, including sports, leaves little room for you to focus on anything but the task at hand. While play is necessary for children to practice a wide range of skills, it also helps adults learn, bond, communicate, and cooperate with others. Playing also helps adults process stress. Those with playful personalities are often better able to cope with high-stress situations, and even transform them into something resembling entertainment. Because of this, fun-loving people who have good senses of humor tend to be more attractive to potential partners. Life is stressful, and it’s more appealing to share it with someone who helps diffuse the tension. Not a playful person? Good news—you can learn how to have more fun with life. You can overcome a more uptight disposition by practicing playfulness. A great way to get your mental play reps in? That’s right: playing sports. Especially if you were very active as a child, playing a sport can help you reconnect with that inner youth. If you’re feeling constrained by the rigidity of routine life, try to reintroduce elements of play in your everyday life. Basically, you don’t need to wait for your summer vacation to give yourself a mental escape. Your brain will thank you. In addition to helping you process and relieve stress, playing sports can do wonders for improving your mood. Being silly and having fun causes a release of dopamine that, simply, makes you feel good. Playing around also often leads to laughter, which has its own host of stress-relieving benefits. And it also helps you connect with your teammates (and sometimes even your rivals). In fact, you’ll likely notice your social life improve from taking up a sport, since people tend to be more positive, open, and vulnerable in fun settings. If improved mental and physical health aren’t enough to convince you to go out and play, this might: playing sports can help give you the competitive edge at work. It turns out that playing sports instills a lot of the same benefits in adults that we know it gives kids. Self-confidence grows when your strength and skills in a sport improve. Combine that with the increase in energy that commonly accompanies regular workouts, there will be an extra bounce in your step. Strengthening leadership skills is another perk of sports participation that can pay off in the conference room. Studies have shown that high school athletes tend to exhibit more leadership traits because of the team-first mindset and adaptivity sports require. If you’d like to have better concentration while at the office, playing sports can help you in that department, too. Regular physical activity (disguised as play) helps keep mental skills sharp—like critical thinking, using good judgement, and learning. And studies have shown that implementing elements of fun in the workplace improve employees’ creative problem-solving abilities and lead to higher productivity. Now you’re convinced to step back on the field. That’s understandable. The importance of play is too much, and the benefits are too good. But there are a few things to consider before you pick a sport and revisit your glory days—or start creating some new ones. First, you need to assess your fitness goals. Ask yourself a few questions: What do you want out of the experience? How many calories are you looking to burn with these activities? What sport best supports the fitness goals you’ve laid out? What sport or playful activity is the most fun for you? Answering these questions will help you pick the right sport for you. Next, assess your fitness reality—right now. Sure you used to be able to jump high and run fast. But what can you do now? Be honest about the kind of shape you’re in. Consider the injuries you’ve accrued over the years and any weaknesses in your current state of fitness. The last thing you’ll want to think about is the amount of fun you’ll have. You don’t want to play a sport that you end up hating. That means picking something age-appropriate that you understand or can learn. Not grasping the rules or strategy makes any sport a painful experience. You’ll also have more fun if you match up the sport to your skills. And, if it’s appropriate, match your skill level to that of your competition. Losing shouldn’t ruin sports, but having a chance to win will enhance your experience. Also think about the cost of equipment or any fees to start playing a sport. Some require substantial investments just to participate. Asking yourself these questions and doing some self-assessment will help you have the best experience possible. Any sport or playful activity that matches up with your fitness goals, is accessible to you, safe, and makes exercise fun is the right choice. If you have a favorite sport, stick to what works for you. If you’re looking for something different, try some of the new sports from the list below. Swimming: Places to swim can be hard to find. But they’re often available at a community recreation center or gym. An average-sized person (155 pounds or about 70 kilograms) will burn 223-372 calories in just 30 minutes. That goes up to 409 if you’re doing more difficult strokes, like the butterfly. Cycling: Access to equipment is one of the only cons for this simple sport. The average person will burn 298-614 over 30 minutes, depending on speed. And if you do it outside, you can soak in the beautiful sights, too. Skiing/Snowboarding: The costs to get started either downhill skiing or cross-country skiing can be a barrier to entry. And, obviously, a lack of mountains or snow also complicate your ability to get into these sports. If everything falls into place, it’s a good way to burn about 225 calories (for an average-sized person) per 30 minutes. The number jumps up to almost 300 per 30 minutes for cross-country skiers. Golf: The pros are a relaxing, competitive time with friends in beautiful surroundings. But golf has cons, too. Access to courses and the price for equipment and greens fees can be tough to overcome. But an average-sized golfer will burn 130 per 30 minutes using a cart, and 205 if they carry their clubs. Tennis: Doubles or singles, it doesn’t matter. Tennis can be a fun way to burn quite a few calories—260 per 30 minutes. There are often public courts available, so all you’ll need is equipment. Racquetball: It’s bit more intense than tennis, and places to play can be harder to find. But racquetball is a fun, spirited workout. You’ll burn 260 calories in 30 minutes of leisurely play. Step that up to 372 if you get more competitive. Boxing: Professional boxers are in good shape for a reason. Sparing takes it out of you—to the tune of 335 calories for a half hour. If you aren’t scared away by some of the more rugged aspects of the sweet science, it can be a fun way to punch through a lot of calories and stress. Martial Arts: Just like boxing, you’ll have find a place to practice and a desire to learn the moves. If you’re ready for judo, kickboxing, karate, and more, an average person will burn about 372 calories in 30 minutes. Kickball: Simpler than baseball or softball, kickball just requires a ball, anything to mark the bases, and some space. And it’s a really good social activity that’s easy on beginners. It’s a nice way to burn about 211 calories per 30 minutes. Softball/Baseball: You’ll need a few more pieces of equipment than kickball, but both softball and baseball offer some of the same social benefits. They’re lower impact than a contact sport like football, but they do require good hand-eye coordination. The average player burns about 186 calories in a half hour. Bowling: Heading down to your local bowling alley is an easy, fun activity. It also has a bonus of 112 calories burned in 30 minutes. Soccer (Football/Futbol): The most popular sport in the world can be played almost anywhere where there’s a ball, players, and some space. In general, the average-sized soccer player will burn 260 calories for every half hour of play. But if you go harder, that number can certainly increase. Flag or Touch Football (American Football): Don’t be scared off by the complexity, equipment, and contact of tackle football. It’s pretty easy to start up a simple flag or touch football game. And in 30 minutes, your average player will burn 298 calories. Not bad for a fun way to spend an afternoon with friends. Volleyball: Big bonus if you can play on an actual beach. But anywhere you play volleyball makes for an easy, social, and fun physical activity. Non-competitive play nets an average person 112 calories burned in 30 minutes. Competitive team volleyball in a gym is about 149 calories, but the beach can get up to 298 calories in a half-hour of play. Basketball: You don’t have to be able to dunk to have a good time playing basketball. 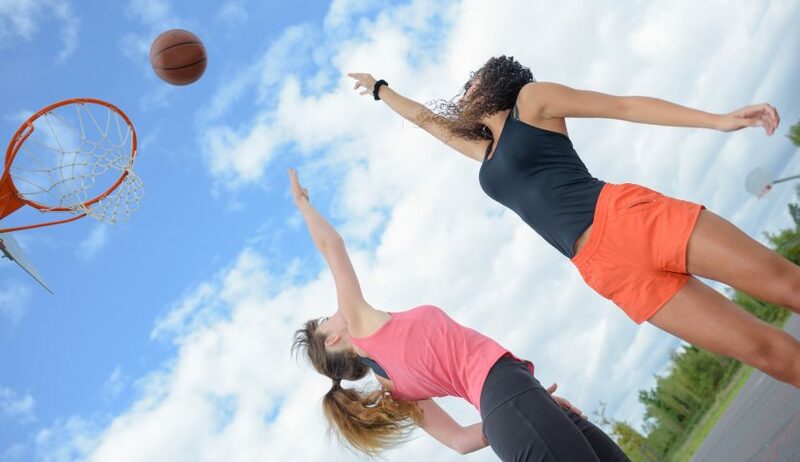 Hop on the court to burn almost 300 calories during a 30-minute game of basketball. You can enjoy playing in many ways. If you don’t have the time, money, or desire to sign up for lessons, you can still have fun with sports. Gather friends for pickup games, get goofy with a game of tag, or play Ultimate Frisbee in the backyard. You can even make up a game. Just get moving, enjoy others’ company, and play—it’s good for your mental and physical health.